ARTISTE not only has a number of technology patents, but also master the world advanced headset design and production experience. ARTISTE is committed to provide users with real, shock of audio-visual feeling! D1 is a wireless headset specially positioned on family video. In the actual video watching, the headset can grasp the proper relative to the sounds in the movie. D1 sound field is more wide, better for the big scene rendering, is the choice for audio enthusiasts! AMAZING SOUND - Enjoy amazing crystal clear sound with a Frequency Response of 30HZ - 20kHZ, Total Harmonic Distortion of 0.5% and Signal to Noise Ratio of 85db. Includes wireless headphones, a wireless transmitter that acts as the headphone charging dock and two AAA NiMH rechargeable batteries. 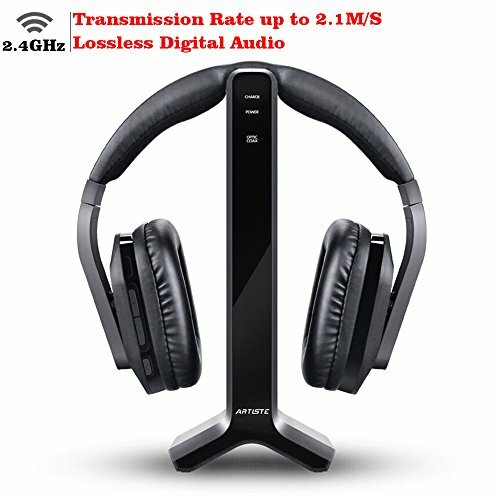 WIRELESS UHF TECHNOLOGY - Our 2.4GHz Digital Headphones use radio frequency signals and have an expanded reception range (up to 100ft) that does not require keeping the headphones within line of sight of the transmitter. Perfect for use with your TV, Computer or Hi-Fi radio. LIGHTWEIGHT AND COMFORTABLE - Adjustable soft padded headband and Over-Ear earpads designed to provide maximum comfort. Listen to music for hours and forget you even wear them! If you have any questions about this product by ARTISTE, contact us by completing and submitting the form below. If you are looking for a specif part number, please include it with your message.